Beautiful. Would have given 5 stars, but has a bit of an odor. Hoping this will dissipate after being aired out. The Madison Park Virginia 3-Piece Tufted Cotton Chenille Duvet Cover Set provides a soft and alluring update to your bedroom decor. This ivory duvet cover features a 100-percent cotton with an elegant chenille medallion design centered on top of the bed. The matching shams beautifully coordinate with the cotton duvet cover to create a stunning Globally inspired/Shabby Chic look. Machine washable for easy care, this cotton chenille duvet cover set easily adds a lovely appeal to your space. Button closures help secure a comforter insert within the duvet cover and the internal ties in the corners help prevent it from shifting. Beautiful duvet cover! Looks fabulous on my bed. I love the matching pillow cases. There are buttons on one side for enclosing the duvet. Just know you will have to fluff the cover every morning so the duvet will reset inside. I'm satisfied with my purchase thus far. I am absolutely obsessed with this duvet! I love it so much! One of my best Overstock purchases. The patterned part is fuzzy. And the button closure is nice. In the past I’ve had “king size” duvet covers that were too small for my duvet, that is not the case with this duvet cover. My duvet fits perfectly inside. I really like this duvet cover. The material is nice but also durable. I end up with so many duvet covers I have to throw out because the material is too light weight, and gets torn easily. This is very pretty as well. I am ordering two more! The duvet cover is just beautiful. It keeps me just warm enough and is a nice cotton material in off white. I’ve already washed it a couple of times and it didn’t faze it one bit. I would recommend this product. 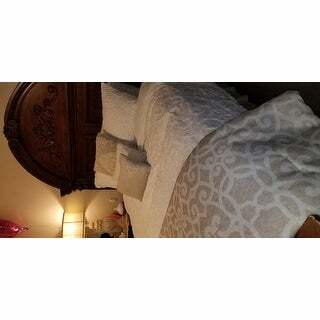 I absolutely love the comforter! It looks amazing and is a great material. However the description said that it has ties in it to attach to the actual duvet. I was really bummed when I went to put it on the bed and found that it DOES NOT have ties. Luckily my mother in law is sew handy and put ties in for me. Otherwise I would have had to return it because that was a deal breaker for me! This is gorgeous. My daughter was redoing her bedroom, so I surprised her with this chenille duvet cover. She was thrilled. She posted her bedroom make over on social media got over three hundred likes. I finally got to see it in person and I was wowed. Just as it appeared on your site thank you. I love this comforter so much that I bought a second one. This comforter has gotten so many compliments, it looks unique and expensive. It is linen with the chenille and is a perfect cream color, like natural linen. Love this set! So comfortable and chic! Left tiny pieces of lint and string all over my room. Also, pillow shams are standard size for a king duvet. This comforter set is dreamy. It’s the perfect set for a farmhouse look. Thick, fluffy and comfy. The color is a perfect ivory whitish combination. Loved this! Looks great in our room. It looks just like i expected, a little shabby chic-ish. It goes perfectly in my Shabby Chic room. I ordered on Sunday night . It was here Tuesday afternoon FAST shipping !!!!!! For the price I was hoping for good quality and I was surprised it’s VERY good quality also nice heavy duty. Has ties on the inside so the duvet does not slide around . "How much, if any, will this duvet cover shrink due to washing." "Can this be used in warmer months as a quilt/coverlet itself? Or can it only be used to cover a comforter?" This is a duvet, you may choose to not use an insert. I love the chenille and the shabby chic look. The ivory will pair with any accent color pillow or quilt.